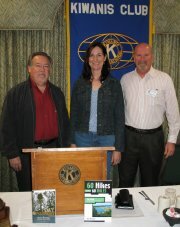 Sheri would love to visit your organization, and can speak on hiking, nature, and their beneficial effects. San Diego County Libraries 4th Annual Book Festival at the Encinitas Library. 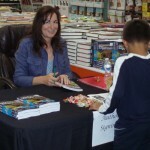 Sheri joined two other authors on a panel about writing on October 13, 2012. See the flyer about the 4th annual book festival. 3 Nights, 3 area REI stores in April! Enthusiastic audiences joined Sheri for an amusing and informative slide show at 3 county REI stores the evenings of April 23, 24 and 25, 2007. Native San Diegan author Sheri McGregor was on hand to answer questions and sign books after the shows. Sheri presented a brief interactive lecture, then autographed books forfun members of the group. Sheri interacted with an enthusiastic, standing room only crowd. A fun Q&A session followed, and Sheri signed her books (Day & Overnight Hikes: Anza Borrego Desert State Park, and 60 Hikes Within 60 Miles: San Diego) for group members. Brown Bag Lunch Presentation and Booksigning!